Recently, members of my family and their spouses and children travelled long distances to meet up in the country which we were grew up in. The purpose of such reunion was for our parents who had been planning to come back to mark their Golden Anniversary with the renewal of their vows in the church where they first exchanged them 50 years ago, and to invite all their respective relatives to a big dinner that night. On the first night of the reunion, the whole gang of 16 decided to have a Chinese dinner in a reputable restaurant not too far from the hotel where we were staying at. Many of you have read that I have hesitated for the longest to write a blog on Chinese food in the DC restaurant scene. This stems from the fact that I have been spoiled by quality Chinese food either in the restaurants, hawker stalls, or at home as I was growing up in that part of the world. When I would come back to Kuala Lumpur to visit my parents before their migration abroad, I looked forward to the home cooking and to our meals at high-end eating establishments that were always a epicurean highlight for me as I was growing up. Here is one such meal, albeit not quite a banquet, but a quality Chinese dinner. First Course: Protein – Chinese Barbeque Pork. Customarily, in a regular dinner, there are no appetizers. 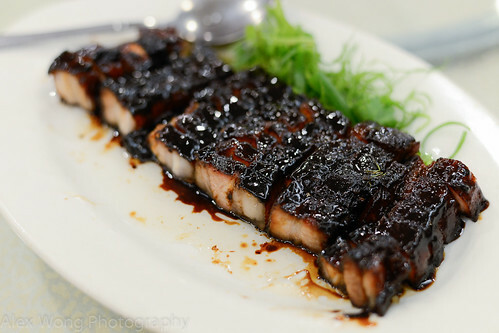 This rendition comprised of small slabs of pork belly, mostly likely a suckling pig, that has been roasted and basted with a molasses-like sweet and salty sauce. This is my father’s favorite dish, and it is usually not amiss among the other orders. 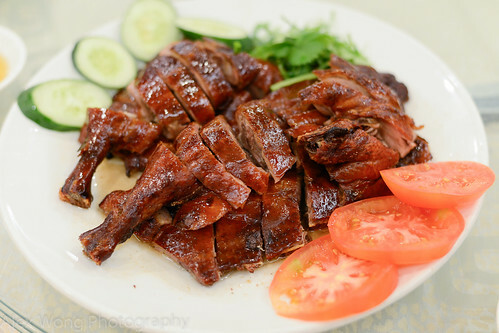 Second Course: Another protein – Roast Duck. The restaurant does a wonderful version here. The meat was still moist yet flavorful with the skin completely rendered of its fat and quite crispy. The flavor was less “gamey” than the ones I have tasted in other countries – this dish would win over the not-so-aficionado of this bird meat. Third Course: Seafood. The Chinese prefer to have their seafood cooked simply in order to showcase the freshness and sweetness of the protein. 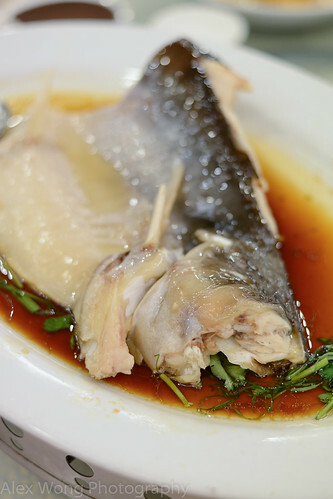 Here a Wild Patin fish has been steamed with some rice wine and ginger juice before lightly covered with a light soy sauce mixture along with some green onion garnish. The flesh was indeed moist and sweet, however, the price of this dish was a bit of a sticker shock – Asians never ask the price before hand. However, it was a worthwhile order for the quality ingredient and cooking. I was just a bit dismayed that they had chopped off the fish’s head, to which the diner would find it a bit suspicious (Asians prefer to see the whole animal/fish intact). Fourth Course: Tofu Dish. 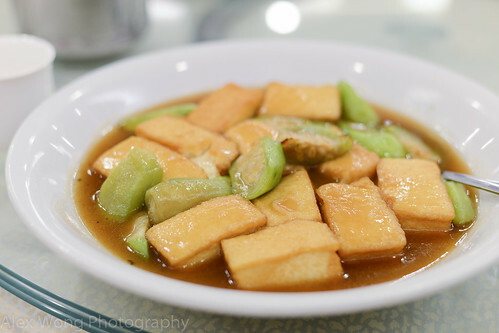 Here, pillows of this soybean cake have been fried lightly to give it texture and body, and they are braised along with some Chinese vegetable resembling a large zucchini in a savory sauce. 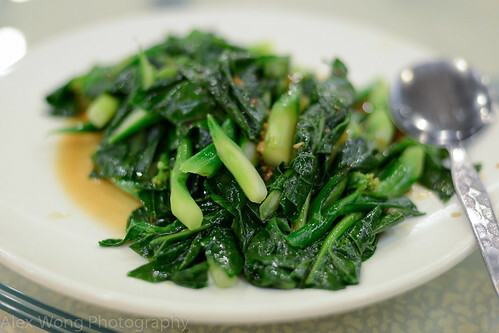 Fifth Course: Vegetable Dish – Chinese Broccoli/Gai Lan. The vegetable has been quickly parboiled and paired with mild sauces like soy sauce or oyster sauce. With this vegetable, it is important not to cook it too long so that the sweetness is retained along with the crunch of the stems. Like the seafood, mildness of flavor and freshness of ingredient are qualities sought after here. Sixth Course: Noodle or Rice Dish. Customarily, a noodle or rice dish served in a banquet is considered more or less a “throw away” dish, meaning, if you are still hungry, you better fill up with this dish. However, in a Chinese regular dinner, it is a bit more purposeful, and in this case, we ordered something that we missed very much – Sang Ha Meen. 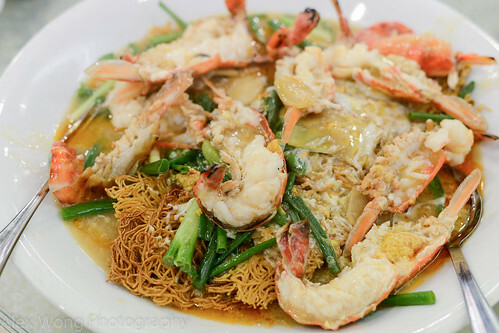 Crispy bits of egg noodle have been paired by large freshwater prawns in a thick eggy sauce spiked with lots of ginger and green onion. It is favorite among my family members, but it took the restaurant so long to serve it and we waited very impatiently. But once the dish arrived, we attacked and ate it with muted hungry mouths. Dessert: Since we had waited for a long time for the last dish and we had young toddlers in the group, we opted to skip this course. Usually, fresh fruits or fruit cocktail would be on the order. In the next couple of blogs, I will write about the Chinese Banquet Meals that I managed to savor on this trip. Hope this blog builds up an appetite for what is to come.